Located at the northeast end of Sandy City, this full service park provides many recreation opportunities for our citizens. Featuring 1 baseball field, a small utility play field, an outdoor pavilion with 7 picnic tables, a playground and a 1/2 mile jogging trail. 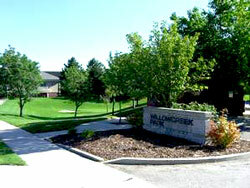 The park is used often by all in the area. One of the prettier parks in the Sandy Parks System. Small gentle slopes provide free sledding and tubing fun for the little ones.